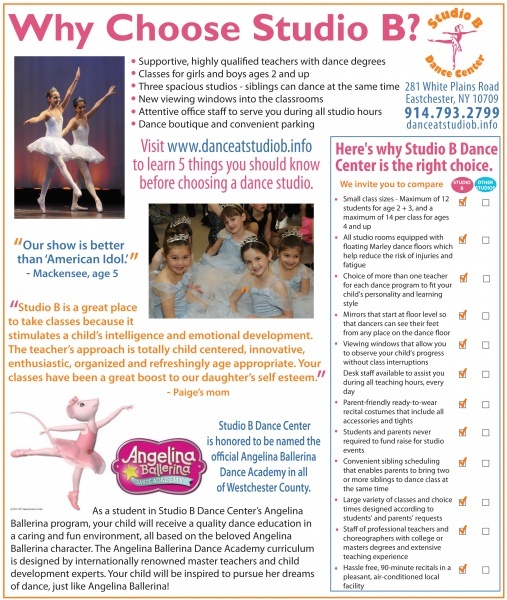 Trying to decide which dance studio is right for your child? Since 1996, thousands of students have taken dance lessons with our highly talented and nurturing teachers. Our state-of-the-art facility is a magnificent place for the tiniest ballerinas and the trendiest teen dancers to feel at home. No matter which style of dance your child chooses, a pattern of enjoying healthy exercise in a dance class can become the foundation for a lifetime of energetic, physical activity. We do not believe we are the best because we’re the biggest. Instead, we believe we’re the biggest because families think we are the best. Click here to see what our students and parents are saying. As a parent, you have a choice among different dance schools. All studios are not the same. We constantly upgrade and improve our facilities and provide ongoing training to our staff to ensure that we are always providing our students and parents with the best experience possible. Today, as in 1996, there are a number of studios to choose among. We invite you to compare all of our studio features and options to see why our dance studio is chosen more often than any other dance school in the area. Click here for a comparison check list. Choose from our 4 popular summer programs! NEW! Angelina Ballerina Dance Camp! Daily and weekly camps available to pick and choose individual days or weeks to dance, play, and create! Learn different dance styles, dive into amazing art projects, and interact with peers. Saturday and weekday summer classes are available as well. For ages 2 and older.